There are so many emotions that a child feels as they go to school for the first time. They become anxious, nervous, or uneasy. They have this thinking that they would never see their parents again. And the thought of being in an unfamiliar environment surrounded by many new faces could scare them. Managing child separation anxiety: Where to begin? Every parent suffers from a child’s separation anxiety at drop off. There are ways to handle them but in some cases, a child would continue crying even when they are already inside the classroom. It may take some time before your child could adapt to the new surroundings. While teachers could help ease anxiety, parents are also important in ensuring that your child gets comfortable in going to school. Children may resist school or leaving home. One way to lessen your child’s anxiety issues is to share encouraging and positive stories about school. Share personal experiences and focus on the good things you learned in school. Telling them about these things will make them feel that what they are feeling is normal and that it goes away. Do not bribe them nor threaten them just so they will go to school. Share the right stories to make them look forward to seeing their classmates or attending classes. During your preschool days, you may have brought a stuffed toy or a favorite pillow to make you feel secure about being left behind. You may also do this with your child to deal with separation anxiety. Anything that you think will work will help. Holding on to something that reminds your child of you or their bedroom lessens their fears and comforts them. It is also an assurance that at the end of the day, they will see you again. Being early always has its advantages. When you send your child for the first time in school, be early. This open time will allow your child to settle in and talk to their teacher about things that bother or scare them. They will also be able to speak with other children and start making friends. Arriving early to school helps a child calm down and relax. A new environment can be confusing for a child. And in school, they are given tasks that they may be too complicated for them. As a parent, it is important to guide your child through these tasks. Walk with them in the school’s hallway so they get used to their new surroundings. Remember to hold their hands to let them know that you will never leave their side. Before you leave, make sure you give them a goodbye hug or a kiss. Anything that will reassure them you will pick them up after school. This gesture will help lessen their separation anxiety and calm them down. Your simple action will make them feel secure and loved. Never leave your child without saying goodbye as this will just increase their separation anxiety. After school, while in the car or during dinner, ask your child what they felt that day. Start by describing their emotions earlier in the morning, like “it seems like you were really sad when I left you in school”. Let them openly express any feelings they might have. Allow them to identify the emotions they felt, like neglect, hurt, or fear. When they say they miss you, let them know that it is a normal feeling. Make them feel that you missed them too and picking them at school is your most favorite part of the day. However, it is important to also dwell on positive feelings. Discuss the new activities that your child did in school or the new friend your child met. Things can get emotional and overwhelming for both you and your child during drop off. There are many ways on how a parent can deal with a child’s separation anxiety. At the end of the day, what matters is how proud you are of your child’s behavior – acknowledge accomplishments and praise efforts. Looking for the best preschool to enroll your child in? 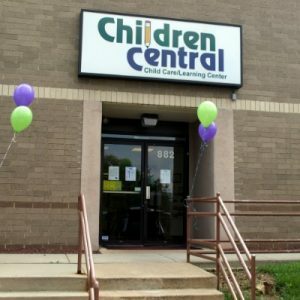 Please feel free to contact Children Central.